Starbucks entered the Indian market in October 2012 through a 50/50 Joint Venture with Tata Global Beverages Limited and currently operates 128 stores in India across Mumbai, Delhi NCR, Hyderabad, Chennai, Bengaluru, Kolkata and Pune, through a network of over 1,700 passionate partners (employees). Mumbai, Maharashtra, India/Businesswire India//– Leading global innovation in coffee for over four decades, Tata Starbucks in India is taking its coffee heritage and inspiration to celebrate International Coffee Week this year with coffee-forward experiences and special promotions across its stores. “At Starbucks we take great pride and joy in partnering with customers on their journey of coffee exploration and are committed to delivering an unparalleled coffee experience. With ‘Starbucks Brewtober’, Tata Starbucks commemorates coffee with a week-long celebration. 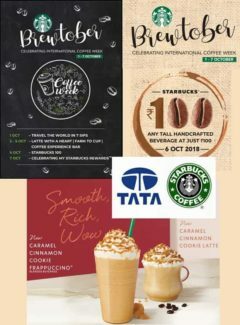 ‘Starbucks Brewtober’ offers coffee lovers a unique way of celebrating coffee, starting with various immersive coffee experiences to the big day of ‘Starbucks 100’ – a day when Starbucks shares coffee love with its customers by offering all its short/ tall handcrafted beverages for only INR 100/-,” said Veetika Deoras, Head – Marketing, Category, Digital and Loyalty at Tata Starbucks Limited. “We hope to celebrate coffee and the spirit of Starbucks through the week and look forward to welcoming our customers in our stores,” she added. Starbucks entered the Indian market in October 2012 through a 50/50 Joint Venture with Tata Global Beverages Limited and currently operates 128 stores in India across Mumbai, Delhi NCR, Hyderabad, Chennai, Bengaluru, Kolkata and Pune, through a network of over 1,700 passionate partners (employees). Starbucks stores are operated by the joint venture, TATA Starbucks Private Limited, and branded as Starbucks Coffee – A Tata Alliance.